We are nearing the end of this challenge. We have shared many things over the last month–our favorite books, songs, where we live, our favorite websites and clothing stores. It has been fun. Today is what is our worst habit. My worst habit is sippin’ the bubbly. No, I’m not talking about the aristocratic Dom Perignon type that you see doled out in Crunk cups on Hip Hop videos on a channel that no longer plays music. I am talkin’ about good ole’ red blooded Americana–Coca-Cola. The drink of champions or is it the champions of diabetes? I don’t know, but I am addicted. It is my only vice. My only real addiction. My worst habit. Yes folks. My name is Robert and I am a colaholic. There I have completed step one. I am on the path to recovery. My how the allure of that curvy 20 ounce bottle has one me. If you only knew. All addicts blame someone for their shortcomings. In this case it rests solely on my mom’s shoulders. She tried to raise us boys well. She bought us school clothes every year at Sears, she sent us to the best public schools that money could buy. She let me play football at six, and she was happy that I was the first of her kids to graduate college even though I had to pay for it. It all started innocently enough. My brother Ryan and I were allowed to drink the forbidden juice (coke) only on special occasions which included eating at the cafeteria at the local K-Mart, and visiting my aunt Bernice, and on Friday nights. That’s it. There were no Big Gulps. No super-sized cups the size of a party keg. No rooting around for spare charge for the vending machine. No trips to the corner store to pick up the carmel colored elixir. On Friday nights is where this demon really grabbed hold. It stuck to me so hard that I could barely shake it’s sugary allure. My mom would let my brother and I stay up late to watch a show called Friday’s. It was Saturday Night Live’s twice removed cousin. It was a show so dreadful that they put it on late at night only to compete with infomercials hawking Japanese knives that cut through bricks and creepy dudes in plaid suits and cheap shoes telling us about weather systems on the fringe of Appalachia where we lived at the time. It wasn’t the show that Ryan and I were interested in. It was the eight ounces of coca-cola in these little greenish glasses with flowers on them. Mom filled them to the rim. We were so excited. We positioned ourselves on the floor upfront of the big console TV, presumably so we wouldn’t spill our drinks on the couch–never mind sitting close to the TV would make us blind. Thank goodness it didn’t. 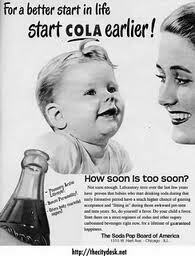 We would take the smallest of sips of our cola and the flavor was an explosion in our little mouths. It sent an immediate sugar rush through our bodies so quick it made out toe-heads spin. We savored our little glasses double gripped with both little hands making sure that every last drop hit the spot. None of it was wasted. That’s when I became a fiend. Not to mention my neighbor, Scott Dunn, who lived down the street. He would lay on the couch all day in cut off jeans shorts and shirtless with a belly the size of Mt McKinley with a a 16 ounce bottle of cola firmly resting at it’s apex. But he was a Pepsi guy. So that’s it folks. The therapy session is over. I admitted I am powerless over things that I can not change. Change??? wait a second do I have enough change for a soda? Next 30 Days About Me. Day 28: Whats in your Backpack? Oooh- this is a good one! I didn’t even think about the fact that Diet Dr. Pepper is probably running thru my veins as I type this. I am for sure addicted. I’ve accepted this vice happily!